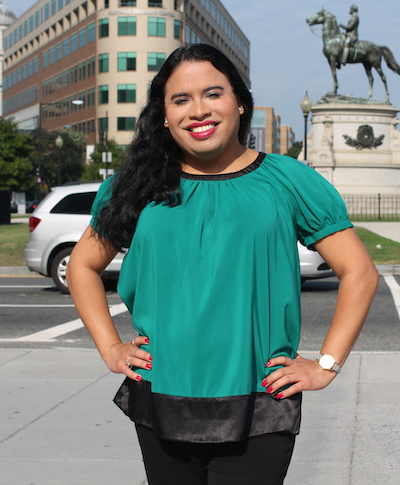 Raffi Freedman-Gurspan will be the first transgender appointee to work in the White House. EDITOR'S NOTE: This story has been updated to reflect that prior to this historic appointment, the White House did hire a trans woman in 2014. who after publication requested she not be named, and has now once again given her consent. President Obama has appointed Raffi Freedman-Gurspan to serve as an Outreach and Recruitment Director in the Presidential Personnel Office. Formerly the Racial and Economic Justice Initiative Policy Advisor at the National Center for Transgender Equality (NCTE), Freedman-Gurspan starts her new job at the White House today. While transgender persons have worked in civil service positions and in various federal agencies or been appointed to presidential commissions and boards previously, Freedman-Gurspan is the first openly transgender appointee to work inside 1600 Pennsylvania Avenue. “Raffi Freedman-Gurspan demonstrates the kind of leadership this Administration champions." Valerie Jarrett, Senior Advisor to President Obama, told The Advocate. "Her commitment to bettering the lives of transgender Americans, particularly transgender people of color and those in poverty, reflects the values of this Administration." Mara Keisling, Executive Director of NCTE, praised Freedman-Gurspan in a statement emailed to The Advocate. "President Obama has long said he wants his Administration to look like the American people," Keisling said. "That the first transgender appointee is a transgender woman of color is itself significant. And that the first White House transgender appointee is of a friend is inspiring to me and to countless others who have been touched by Raffi’s advocacy." "Raffi’s decade of experience brings important qualities to this historic appointment. She has been a vital part of NCTE focusing on the experiences of transgender people of color​a​nd those living in poverty. Her work included advocacy on issues such as improving the conditions for transgender prisoners, addressing biased policing against transgender communities, limiting the use of detention for undocumented transgender immigrants, and finding solutions to address violence against transgender women of color." Freedman-Gurspan's appointment also drew praise from other racial and economic justice advocates and leaders. Aisha Moodie-Mills, president of the Gay & Lesbian Victory Fund and Institute, celebrated the appointment for its historical merit. "Our government works best when it reflects the reality of who we are as Americans," she said. "For the first time in history, a transgender American will serve the president as a member of the White House staff. We’re celebrating because this is an important milestone for the transgender community, but we’re also thrilled that Raffi Freedman-Gurspan, an incredibly smart, talented, and committed professional, will now be working for the American people." "Raffi Freedman-Gurspan understands how policy affects real people," Marcia D. Greenberger, Co-President of the National Women’s Law Center said in an emailed statement. "It’s of great importance that Freedman-Gurspan will bring her impressive track record and experience in advocating for social and economic justice to her new position in the White House. Her deep commitment in advocating for those most in need and without a voice in our society will be a tremendous asset to the White House and to the country as a whole." Freedman-Gurspan was also the first transgender woman to work in the Massachusetts state house where she was instrumental in passing the state's Transgender Equal Rights Law. Carl Sciortino Jr., Executive Director of the AIDS Action Committee of Massachusetts, also chimed in on the appointment, reflecting on Freedman-Gurspan's history in the Bay State. "Raffi is a role model," he said. "I am proud to see her continue to lead by example, as she takes her voice and her passion to the White House. Her hiring is a symbol of progress for the transgender community, but without a doubt I know it will be her skill and hard work that will benefit many." Prior to this, Dylan Orr was the president's first openly trans appointee. He was named special assistant in the Labor Department's Office of Disability Employment Policy in 2009. He now works in Seattle city government. Amanda Simpson was the first transgender woman so honored, appointed to the Commerce Department in 2010. She now works as the Executive Director at the U.S. Army Office of Energy Initiatives. As The Advocate previously reported, Amelie Koran was the first transgender civil service employee to work in the White House. In 2014, Koran served in the Office of Management and Budget, as well as in the Office of EGov, as IT for the Federal CIO, and as fellow in the Presidential Management Council's Interagency Rotation Program to develop future executive leadership. She participated in the pilot for the US Digital Service, led efforts of the Open Data Initiative (Presidential Management Agenda) and reviewed IT and cybersecurity legislation, including several edits which are now law as part of the FISMA Act of 2014. Koran now works at the Walt Disney Company in Los Angeles. And this past June, Shannon Price Minter, a trans man and legal director of the National Center for Lesbian Rights, was appointed to President Obama's Commission on White House Fellowships.